Home Condiments chutney HOW CAN FRUCTOSE BE BAD IF IT IS IN FRUIT? That is probably the most frequently asked question I hear when I talk to people about the low-carb lifestyle. Our health organizations tell us that fruits and vegetables are the basis of a healthful diet. They always refer to “fruits and vegetables” as if they are one category and equally beneficial, but they can be as different as candy is from kale. Technically, any part of a plant that contains seeds or is involved in reproduction is a fruit. Leaves, stems, and roots are vegetables. But, in common usage, we classify plant foods based on sweetness. If it is sweet, we call it a fruit; if it is not, we call it a vegetable. Most of us can tolerate a few berries, but if we want to cut down on carbs, we must limit or avoid some fruits. When we eat too many of the sweet ones, such as bananas, grapes, mangoes, and pineapple, we get a big dose of sugar, much of which is fructose, the most dangerous of all the sugars. However, you’ll have no trouble getting your recommended two servings of fruit a day while sticking to your low-carb eating plan if you remember that an eggplant is a fruit. Avocados, zucchini, green beans, and olives are fruits. Pumpkin and cucumbers are fruits. A tomato is a fruit. And there is no end to the things you can do with these “vegetable” fruits. It seems perfectly normal to have pumpkin pie made out of a “vegetable” fruit, but you don’t need to stop there. I also make avocado ice cream, chayote squash apple pie, and black bean cake. I’ve even made “raisins” out of olives (still working on that one). Green tomatoes and tomatillos are my new favorite “vegetables” to use as fruits. When they are still crunchy and tart, green tomatoes make a perfect substitute for apples in jams, chutneys, sauces, and pies. 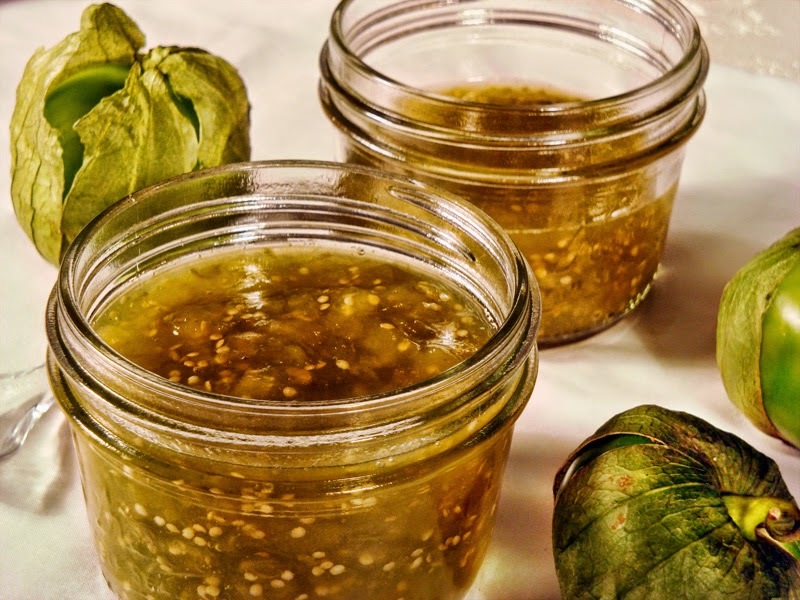 Tomatillos, familiar to most of us as the main ingredient in salsa verde, are the little green fruits encased in a papery lantern commonly used in Mexican cuisine. While green tomatoes are only available in late summer, and then only if you have access to a local garden, tomatillos are easy to find fresh and canned year round in many groceries and ethnic markets. They are also known as husk tomatoes or jamfruit; the name “jamfruit” inspired my recipe for the sweet/hot tomatillo jam in Carb Wars. Below is my recipe for Tomatillo Sauce. It makes an interesting alternative to cranberry sauce for your holiday table or a dessert topping for ice cream or puddings. If you cook it down until it is thick, you can use it like jam or as a filling for pies and tarts. Remove husks from tomatillos and wash off sticky residue. Chop into small pieces, reserving juice and seeds. Mix the fruit, the reserved juice and seeds, and the sweetener. Let stand for 24 hours to draw out the juices. Place fruit and juice in a heavy saucepan. Grate the thin, yellow part of the lemon rind into the pan and add the lemon juice. Bring mixture to a boil over high heat. Reduce heat to low and cook, uncovered, for about 40 minutes. Remove cinnamon. To thicken, puree some of the mixture in a food processor or press through a sieve and return to the pan. Use like cranberry or apple sauce, as jam, as a topping for yogurt or ice cream, or spread it in a low-carb tart crust. See variation below for Pocket Pies. Refrigerate or freeze. Recipe makes 1 cup of sauce or 16 servings of 1 tablespoon each. *Sweet fibers are sugar substitutes with bulk, such as Sweetperfection©, Just Like Sugar©, or stevia blends with oligofructose or erythritol. You could also use xylitol or maltitol. Joseph’s brand pitas are very thin and make a crisp, pastry-like crust. They have only 2 net grams of carbs in each half for a total of 3.8 net per pie (excluding the ice cream). Cut a low-carb pita pocket in half. Melt a tablespoon of butter in a skillet over medium heat. Add one pita half and fry until brown and crisp. Turn over. Carefully open the pita with a fork or spatula and spread ¼ cup of drained Tomatillo Sauce inside. Continue to fry until second side is brown. Sprinkle with cinnamon and more granular sweetener and serve hot with a scoop of low-carb ice cream. Wipe out the pan and repeat with other half. Fructose, Tomatillo jam, Tomatillo pocket pies. Bookmark.